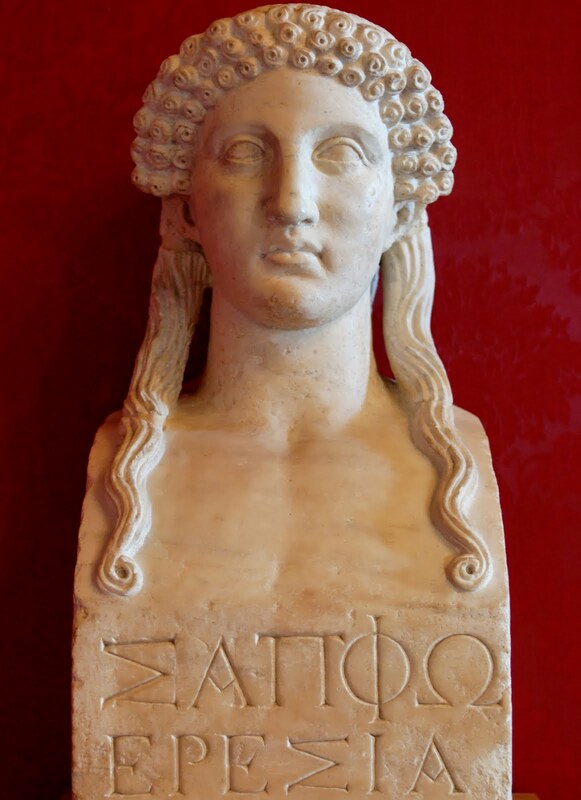 “Though only breath, words which I command are immortal,” wrote Sappho almost 3000 years ago, and since we are reading them all these millennia later, I would say that she was right. Words not only endure, however, but also transform, move our spirits forward, and fly us to realms and into universes and ways of thinking where we would never otherwise go. Feminists have always known the power of words and so have, from the beginning, insisted on pointing out the oppressive nature of some words that describe women and others that exclude women from religious, social, economic, and political life by making assumptions, for example, that Divinity or those who fill political positions are male and so should be called by male names. But what about the other words? I do not see the young women I know in the term “maiden,” which to me has a bit too much of an image of a medieval sweet young thing gamboling among the May flowers. What about changing “maiden” to “Gum Lin,” the name of a smart, courageous, self-confident young woman from Chinese folklore who, with her female BFF, saved her village by distracting a dragon through song long enough to steal his key that opened a gate to irrigate the village crops? For “mother,” a word that overlooks all those women who have not given birth, how about “matrix” for that time of life after “Gum Linhood” when we are deep in the thick of life in the outside world? “Matrix” retains the creative sense of “Ma,” whether the creation is of people, artwork, communities or what have you, while also evoking the ways that women in this time of life are often the center of complex webs of connection, whether of family, workplace or community. I personally like “crone,” so I’m keeping that one. Another word we need to invent depicts women’s spiritual power, that deep, primeval, power that gets us through each day, no matter what challenges we face, and that manifests itself when women are shamans, leaders, brilliant artists, and in other ways bring spiritual power into our world through our actions and who we are as people. I would like to propose the word “Mlima,” which, as I understand it, is the Swahili word for “mountain.” It is appropriate, I think, for the word to come from Africa, where all humans originated, just as women’s spiritual power comes from the most original and central place in our being. Our spiritual power can be wild and overflowing, like a volcano. It can be verdant and creatively abundant, like a mountain with forests and rivers. It reaches into our deepest places, like the base of the mountain in the Earth, and also connects us to heaven, as when we reach a mountain’s summit. Finally, I’d like to propose the word “Uzume” for the many women who are modern-day priestesses, not just those who have an official capacity but the millions of women who lead other women to a sense of their own sacredness in their everyday actions as family, friend, artist, or other role. Uzume is the Japanese goddess of merriment who, when the Shinto sun goddess Amaterasu hid herself in a cave, created such a ruckus with her dancing that Amaterasu came out of her cave, saw her sacred beauty in a mirror placed by the cave’s opening, and returned again to bring light and life to Earth. When we create new words, we conjure new ways of thinking that can transform us, and through us, the world. What other words do you think we need? What should those words be? The stories of Gum Lin and Amaterasu come from Patricia Monaghan’s amazing New Book of Goddesses and Heroines, published by Llewellyn Publications in 2000. Previous Tanya Tagaq Sings with the Voice of Gaia Next Time for Change: What Do the Goddesses Say? Oh, how I am so loving this post, as I’ve been pondering the reappropriation of certain words recently. Especially like the label of Uzume, one of my favorite Goddesses!